Yesterday I made my famous pasta. (Uh, okay... I made pasta.) It's sooo good. And since I have no idea what to write about today (haha, sorry. I will make a schedule for the future! ), I'll give you guys the recipe. I don't really measure how much of everything that I put in. I just kinda see how it looks. Start off with cherry tomatoes (or any kind of tomato. I just prefer cherry. They're so good & sweet.) and dice them. I leave some of them whole sometimes, because warm cherry tomatoes that pop in your mouth are SO good. So cut up the tomatoes, then throw them in a sauce pan and add olive oil and white wine vinegar. Or red wine vinegar. Whichever you prefer/have. I used red wine vinegar yesterday because I couldn't find the white wine and I was too hungry to look. I loooooove garlic so I add a lot of garlic cloves. Our neighbours down the street grow garlic and gave us some bulbs and this is the best garlic I've ever had. The garlic cloves are HUGE and so strong. So I only used two, haha! That's probably a lot to everyone else, but I think garlic is one of my favourite foods (is garlic a food? Ah, who cares.). Then I put in a bunch of dried oregano. Oh and add sea salt and fresh ground pepper (or just plain old salt & pepper!). I keep in on the stove for a while and just have it on low-medium heat and stir every once in a while. Then put some water on the stove to boil it. I usually use orzo or angel hair pasta, but all I could find was the spiral kind. But, any kind of pasta works. (I mean, they all taste the same, don't they?) So once the water boiled I went out back and picked some fresh basil and oregano for the top. And grabbed some Parmesan cheese. Sometimes I add in some brie cheese just before the pasta is cooked, or ricotta, or other kinds that I can't think of right now... haha. And sometimes I add in a bit of cream to make it nice and creamy. It's so good... Mmm. It's good cold the next day (or later that night) too. If you like cold pasta, that is... Sometimes I like to put a lot of grated mozzarella cheese in it, then put it into a baking dish and put more grated cheese on top. Then put it in the oven a bit to melt it and it's sooo gooooood... haha. If you make this let me know how it turns out! :) garlic is totally a food - right?! Garlic makes every food better - how's that! Thanks for the recipe! I'm not much of a cook, but I like to try every once in awhile! YUM! 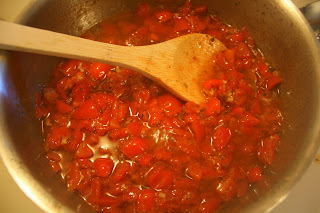 I usually make my tomato sauce by slow-roasting tomatoes. 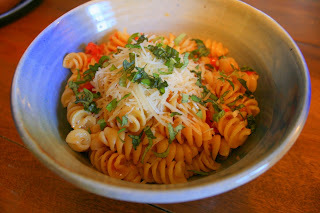 This looks so good, Italian (besides Indian) is my favorite food genre! yumm yum!!! my mouth is watering. i. love. garlic!!! This. Looks. Soooooo. Good. Like, Soooooooooooooooooooooooooooooooooooooooooooooooooo Good. And something that even I, the-woman-who-sets-off-the-smoke-alarm-every-time-I-cook, can do. Thanks for sharing & for the delicious pics, Holly!